New Delhi, June 21: Just 10 days are left to exchange pre-2005 currency notes, including those of Rs 500 and Rs 1,000 denominations, at banks as the deadline to do so is ending on June 30. Seeking cooperation for withdrawing pre-2005 currency notes from circulation, the RBI has asked the public to deposit the old design notes in their bank accounts or exchange them at a bank branch convenient to them. The earlier deadline was January 1, but later the Reserve Bank had extended it till the end of this month. All pre-2005 notes continue to remain a legal tender. These notes can be exchanged for their full value at bank branches. It is easy to identify pre-2005 notes. The currency notes issued before 2005 do not have the year of printing on the reverse side. 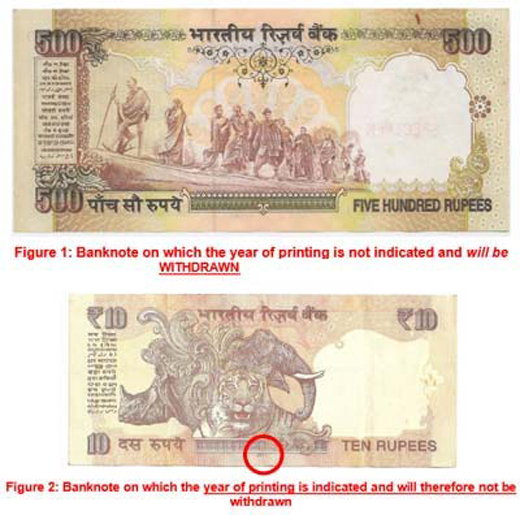 In notes issued post 2005, the year of printing is visible at the bottom on the reverse. It is standard international practice to withdraw old series notes. Over 164 crore pre-2005 currency notes of various denominations, including of Rs 1,000 were shredded in regional offices of Reserve Bank in 13-month period ending January. The face value of the shredded currency notes was around Rs 21,750 crore. As per the details given in Parliament in March, 86.87 crore pieces of Rs 100, 56.19 crore pieces of Rs 500 and 21.75 crore pieces of Rs 1,000 were shredded.